Those who have read Vitamin C Cures: Heart Disease (formerly Practicing Medicine Without a License) know that modern medicine, orchestrated by Big Pharma, has been able to keep secret the true nature of cardiovascular disease, including heart disease and stroke. Chapter 2 of The Great Suppression is a review of chronic scurvy, aka heart disease, for those who haven’t read Volume 1. Linus Pauling (and associates) discovered and patented a simple, low-cost, non-prescription, safe and effective cure for the number one killer of Americans. What was Linus Pauling’s reward for this great discovery? Ridicule. Over and over Pauling was ridiculed and portrayed in the mainstream media as a “nut” and a “quack” for recommending that people take more vitamin C than the government recommends. There are thousands upon thousands of published scientific papers and articles about vitamin C, one of the most studied substances in the history of science, and some even have to do with heart disease. Yet, there hasn’t been a single study of Linus Pauling’s specific high-dose vitamin C and lysine protocol. Not one. The leading killer in the United States, the condition that those in the medical field call heart disease or occlusive cardiovascular disease, is really a low-grade form of the vitamin C deficiency disease scurvy. The vitamin C deficiency disease scurvy is characterized by scab-like build-ups that slowly grow on the walls of blood vessels. The underlying disease process reduces the supply of blood to the heart and other organs resulting in angina (“heart cramp”), heart attack, and stroke. The correct terminology for this disease process is chronic scurvy, a sub-clinical form of the classic vitamin C deficiency disease. The fact that heart disease is caused by a vitamin C deficiency is becoming increasingly more difficult for modern medicine to deny. Interestingly, under current federal law in the United States, a vitamin used to cure its deficiency disease is specifically excluded from FDA drug enforcement. The true nature of cardiovascular disease was identified in the early 1950s by a Canadian team led by G. C. Willis, MD. This finding was confirmed in the late 1980s by leading scientist Linus Pauling, PhD. Pauling alerted the world to this discovery in lectures, in writing, and on video after he and his associates conducted experiments that confirmed the Willis findings. To date, Pauling’s announcement has never made its way into a mainstream media outlet. Moreover, cardiologists are taught and routinely tell their patients that there is no connection between vitamin C and heart disease and there is no value in vitamin C in amounts much higher than the minuscule recommended daily allowance (RDA). From a scientific standpoint, anyone who tries to challenge the true nature of cardiovascular disease should be made to cite experiments that refute the Pauling/Willis chronic scurvy hypothesis. However, such experiments have never been published. It has been twenty-four years since Pauling began his lecture tour. Pharmacology professors Steven Hickey and Hilary Roberts in their recent book ASCORBATE: The Science of Vitamin C (2004) document that there have been no independent experiments published that were designed to test the Pauling hypothesis (except one at much lower doses that was conducted by Pauling’s close associate Dr. Matthias Rath). We are aware of only one clinical study in humans that has been carefully designed to test the Pauling high-dose hypothesis. The study was performed in the United Kingdom using a sample of 200 men over a period of three years, and the data confirmed Pauling’s theory and therapy. Yet, so far, Dr. Kale Kenton’s study has not appeared in a medical journal. Many wonder, will the giant pharmaceutical industry facing these facts survive, or will it collapse in 2017? The public is beginning to realize that the world’s most profitable industry is a very wealthy house of cards. Some believe that its most profitable products are at best useless, at worst dangerous. Prescription drugs beget more drugs. The secret that could create difficulty for Big Pharma is that taking high doses of vitamin C and avoiding toxic prescription medications can help humans to achieve optimum health. The 800,000 Americans who die needlessly every year are those who heed their cardiologist’s advice. The American Heart Association estimates that 63 million Americans suffer from cardiovascular disease. More than 1 million undergo some form of heart operation, and over 15 million are taking statin cholesterol-lowering drugs on the advice of their doctor. These popular statin drugs are known to deplete CoQ10, which could cause heart failure. The pioneering research into the relationship between vitamin C and heart disease began in the late 1940s, not long after the structure of vitamin C was determined. Canadian doctors proved that a vitamin C deficiency causes the condition commonly called atherosclerosis. These doctors found that the condition will arise in 100 percent of vitamin C-deprived animal test subjects that don’t make their own vitamin C. Furthermore, these Canadian pioneers demonstrated that vitamin C alone reverses atherosclerosis in laboratory animals (THE REVERSIBILITY OF ATHEROSCLEROSIS, G. C. Willis, Canad. M. A. J., July 15, 1957, Vol 77., Pg 106-109). The team also performed similar studies in humans. The results, while not conclusive, showed reversals of atherosclerotic plaques in one-third of the human subjects. Notably, these studies were of low oral doses of no more than 1500 mg per day (SERIAL ARTERIOGRAPHY IN ATHEROSCLEROSIS, G. C. Willis, A. W. Light, W.S. Cow, Canad. M. A. J. Dec 1954, Vol 71, 1954, p. 562-568). The knowledge that heart disease is a form of scurvy has been suppressed since the first series of Willis’s articles were published in the Canadian Medical Journal in the early 1950s. Inexplicably, since the 1950s, no articles favorable to vitamin C and its connection with atherosclerosis have appeared in a reputable medical journal that is widely read by medical doctors. 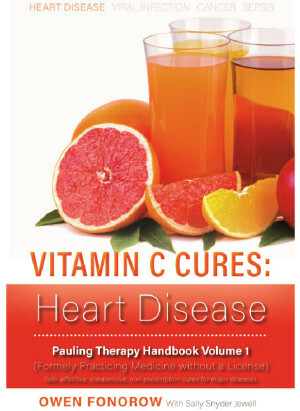 Cardiologists in training are taught that there is no relation between vitamin C intake and heart disease and that it is “quackery” to suggest otherwise. These assertions seem justified due to limited reports of such studies. However, as vitamin C expert and pharmacological professor Steve Hickey points out, every cardiologist could have performed these studies on their own. There is no doubt that the news of this cure has been suppressed; otherwise, most of the public would have learned about the existence of this cure from two-time Nobel Prize winner Linus Pauling. Millions of people are dying needlessly due to a lack of disseminated knowledge of the Pauling discovery. Is Linus Pauling’s high-dose ascorbic acid (vitamin C) and amino acid therapy the cure for heart disease? The crime is that no one knows the answer. Pauling and his former associate Dr. Matthias Rath did their part by running the experiments and attempting to publicize these discoveries. Now it is up to other researchers in the medical scientific community to do their part. If there is a chance that Drs. Willis, Pauling and Rath are correct, is it immoral or a crime-against-humanity that no further experimentation has been done? One could pose that medical science is controlled by the drug industry. The American Food and Drug Administration (FDA) is controlled by the drug industry. Even the United States National Institutes of Health (NIH) gives all appearances of being under the control of the drug industry, and it seems that not even members of the US Congress can overcome this obstacle. In the years 1998 and 2002, the Vitamin C Foundation submitted grant requests for government funding to study Dr. Pauling’s theories. These requests were formally submitted to the new Office of Alternative Medicine at the NIH (http://vitamincfoundation.org/NCCAMgrant). The Foundation sought funding so that Linus Pauling’s recommended therapy would be fairly investigated in humans. All previously known tests have been performed with less than adequate amounts of vitamin C. These grant applications also put the United States government on notice that Linus Pauling had made the claim of an outright cure for heart disease. The NIH was free to design, sponsor, and run their own study with their own choice of scientists. Had such studies been conducted, millions of lives and billions of dollars might have been saved. Unfortunately, the NIH Office of Alternative Medicine rejected both grant requests and failed to run their own studies. Many believe that cardiology has been on the wrong path for a long time. The result of this is that heart disease is still the leading cause of mortality in the United States and statin cholesterol-lowering drugs have become the top-selling class of prescription drug. Statin drugs generate more than $7 billion in annualized sales, but these drugs have significant side effects. vitamin C, with annualized sales close to $180 million, has the very same cholesterol-lowering property as the popular statin drugs. Individuals using home cholesterol-monitoring devices such as the LifeStream® monitor, which is available in 55,000 retail outlets, report that 6000 mg to 10,000 mg of vitamin C may be required for maximum cholesterol-lowering effect. The structure of coenzyme Q10 (CoQ10 or ubiquinone) was determined by the Merck scientist Karl Folkers after its discovery in 1957. [*] There have been at least 35 clinical studies showing CoQ10’s massive benefits for heart patients, especially patients in heart failure. [*] In Japan, until last year, CoQ10 was a heart medication only available by prescription. Merck has more than one patent for adding CoQ10 to statins as a means of circumventing the issue of blocking CoQ10 biosynthesis (US Patent 4,933,165). The fact that Merck has had these patents since 1990 shows that members of the Merck corporation have been aware that statins cause muscle deterioration. However, the Merck patents were never implemented, most likely because the world supply of CoQ10 is far too limited to supply all statin drug users. For many, it is sad and truly frightening that today’s hottest-selling class of prescription drugs, statin cholesterol-lowering drugs, are known to deplete CoQ10 synthesis, yet these drugs are routinely prescribed to heart patients! Transient Global Amnesia: Another Statin Side Effect? Former NASA astronaut Duane Graveline, MD believes that the statin drug Lipitor® caused his own case of transient global amnesia, or TGA (http://www.spacedoc.net/Statins_flyer.html). Graveline believes that these drugs are the cause of a recent epidemic of TGA to hit emergency rooms. Fearing the dire possibilities of airline pilots who take statins, Dr. Graveline has begun a crusade to educate the medical profession and public about the potential danger of cholesterol-lowering drugs. The vitamin C foundation has posted its collection of concerns at www.vitamincfoundation.org/statinalert. It has long been known that human arteries weaken without vitamin C and other necessary nutritional support. Atheromas, or soft atherosclerotic plaques, are abnormal formations that appear in arteries. Dr. Pauling and associates theorized with Willis that such plaque formations serve to strengthen arteries because they appear most often where blood pressure is highest. At times, a weak artery can rupture, and the resulting clot can cause a heart attack or stroke. This condition is most properly characterized as chronic scurvy. Atheromas in the microscopic arteries in the retina have been clearly visible to eye doctors, but until recently, they did not believe that such build-ups were reversible. Dr. Sidney Bush of the United Kingdom accidentally discovered that atheromas can be reversed in those patients instructed to take from 3,000 mg to 10,000 mg of vitamin C. Dr. Bush made his discovery while studying eye infections in contact lens wearers. Vitamin C was being tested as a preventive measure for these infections, and with serendipity, Dr. Bush noticed that atheromas disappeared in the patients taking vitamin C. Dr. Bush reported that some patients require as much as 10,000 mg daily to reverse soft atheromas. Dr. Bush has invented a new diagnostic technique that he calls CardioRetinometry. He believes this method of diagnosis will revolutionize cardiology. A new diagnostic technique can access coronary heart disease risk (CHD) suggested by universal retinal arterial atheroma, previously suspected as irreversible. Physicians, optometrists, and ophthalmologists were not expecting that vitamin C would have this effect. Dr. Bush has also promoted the idea that chronic scurvy not only exists, but it also can be accurately measured. Eye doctors can now easily diagnose this condition by examining the microscopic arteries behind the eye before any symptoms of heart disease manifest. Thanks to Dr. Bush, we now know that vitamin C can reverse the condition in short order at the optimal dosage determined by CardioRetinometry. Cardioretinometry clearly demonstrates the relationship between vitamin C intake and “atheromas,” plaques forming on the arteries that serve the retina in the eye. Dr. Bush has published before-and-after pictures taken with his new method and advocates for rigorous studies. The atheroma of the retinal arteries is a virtually perfect surrogate outcome predictor of coronary heart disease and will continue to be so as long as the eyes are connected to the rest of the system. Modern electronic eye cameras and microscopes with high-definition magnification show the impact of cholesterol beautifully, as well as how it dissolves back into the bloodstream when the system is restored to balance. This effect is seen in arterioles too small to be seen with the naked eye! While day-to-day variations in the pericorneal vessels are a relatively easy readable barometer of ephemeral scurvy, especially when viewed via the slit lamp biomicroscope of the contact lens practitioner, only a few dedicated medical practitioners have paid it attention. The pericorneal arterioles and capillaries can and are graded in a system of practice into ten degrees of scurvy, allowing an accurate prediction to patients of how much or little vitamin C they have been eating. The highest mark anybody has had is 94%. When this grading began in 1997, Dr. Bush confounded his nursing staff by being able to correctly identify patients who ate no or few greens. But the same ease of observation does not attach to the identification of the chronic subclinical variety. It cannot identify dietary faults in the most recent past. In a similar way to the slow build-up of vitamin E in the body fat and cell walls of the brain, it takes over a month to confirm what is happening to the cholesterol in the retinal arteries. Dr. Bush now has evidence that even calcified hard plaques can be reversed over the course of two years on a high vitamin C intake. This development throws a hammer into the Government/CODEX recommended daily allowance of 60 mg and the 2000 mg maximum tolerable allowance. Given this information, it is imperative to have regular examinations of the retinal arteries by a suitably equipped optometrist trained in CardioRetinometry. After five years of observation of his patients’ health, Dr. Bush believes that this is the most valuable safeguard of one’s cardiovascular health in addition to the many other body systems that work closely with the cardiovascular system. In 1994, no one knew whether Linus Pauling’s high vitamin C and lysine protocol actually worked. Our company, then Intelisoft Multimedia, Inc., (now Inteligent*Vitamin*C, Inc.) had obtained the rights to the Pauling video on heart disease [*] and tried to promote it. At that time, we had no financial interest in any nutritional product. Years later, we realized that Pauling’s close associate Matthias Rath had not fully appreciated what Pauling had been advocating. (We assumed this because of his company’s low dosage recommendations.) For this reason, we took on the task of promulgating Pauling’s discoveries. Tower Laboratories Corporation was willing to promote a new product with sufficiently high doses of vitamin C and lysine that matched Pauling’s dosage recommendations. From the beginning, the Pauling therapy began to cure the incurable, miracle after miracle. Many of these testimonials have been written and are posted from at VitaminCCures.com. However, the media has not yet printed a word about this phenomenon. Kevin Trudeau has written a book titled Natural Cures ‘They’ Don’t Want You to Know About (naturalcures.com). Trudeau points out that it is against federal law to say that a particular product cures a disease without consent from the government. This mandate has angered not only Kevin, but also many others who strongly believe that these products could improve the health and lives of so many. Your writing is so easy to read, basic–like 2 plus 2 equals 4. I suggest that my students each read it for their own education and for their family and friends, especially if they have any heart problems. “Hi Owen, I received your book from Sally Jewell. What an eye opener, I pray that people will get there hands on it. You are helping a lot of people, and your rewards will be great. I loved the testimonies in the book, I read them over and over. “Hi Owen, Just want you to know that I finished your book and wrote a review, which has been published on Amazon. It’s a rather comprehensive and very positive 5-star review, although I did make one criticism. I’m emailing you in fairness in case you or your associates might want to comment below my review in defense of the criticism. However (as I indicated in the review) the information you provided about lipoprotein(a) is exceptionally helpful, and that alone is worth more than the price of the book. Can you advise if the sequel Vol 2 of Paulings Therapy Handbook is available yet? Info relevant to someone with minor “CVD”; 3 stents and on a statin anticholesterol script with “marginal” side effects; shortness of breath some muscular weakness, chromic mild gout in the toes and recently diagnosed with 95% blocked artery and “inoperable”. I do concede I’m probably obviously deficient in Vit-C. It doesn’t sound like your CVD is minor, and if Linus Pauling was correct (he was) you need to find a level of vitamin C that keeps your arterial system strong and healthy, and also a level of the amino acid lysine to reverse what the body was trying to do to protect itself and keep your weak arteries from leaking.